Generate a live drawing or blueprint along with a full spring analysis and custom quote of your extension spring using Spring Creator, our free online spring calculator. Engineering an extension spring design is no easy task. You have to make sure you have the right spring dimensions, that it is strong enough, that it is elastic enough, that the initial tension won’t throw off your working loads. There are many, many factors involved and when you’re done, the least thing you want to do is draw up a blueprint. Well, at Acxess Spring, we have made both processes easier. You see, with our extension spring calculator you’re able to engineer a design by only inputting the dimensions and adjusting them as you go. Spring Creator will calculate spring rate, initial tension, maximum safe load considering hook stress, and maximum safe travel considering hook stress amongst many other calculations. All of this information is then added to a blueprint if you choose to generate a drawing. The extension spring drawing/blueprint is also live and every dimension shown on the print is proportionate to the real size of your spring. The above information like spring rate and initial tension are also included in the full spring analysis amongst all of the other specifications. All of the information provided on our extension spring drawings is useful for something. The physical dimensions help you make sure that the spring will be able to be installed correctly into your extension spring application. The spring rate and the force and travel capacities will help you calculate your spring’s working loads and see your spring’s force and travel limitations. The weights and measures help in both the manufacturing and the shipping of your spring so we know both how much material we will need in order to complete the job and we know how much the package will weight when shipping the order out. Our extension springs drawing also includes a custom spring quote and stock spring suggestions. The stock spring suggestions are given to you by The Spring Store. The calculator automatically searches for similar springs in stock when you run extension spring calculations and it brings back results of similar extension springs in stock. In order to get a quote though, there are certain parameters. You will not be able to get a quote on very large extension springs for there is a limited range of dimensions which your extension spring must fit into in order to get the quote. 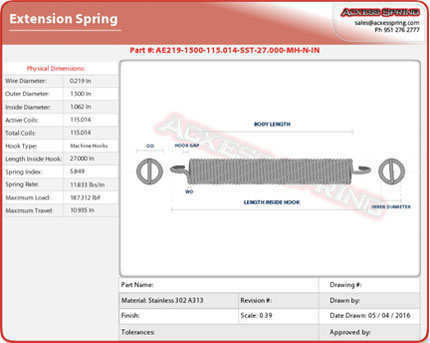 This is a temporary limitation because, at Acxess Spring, we specialize in innovating the spring industry so getting your extension spring quote will become easier with time as we update the quoting system embedded into our extension spring calculator.